A few days ago, Jill of Keyboard Revolutionary wrote about the practice of "pit to distress"--a term for aggressive administration of IV Pitocin during labor. Jill of Unnecesarean wrote more about it two days ago. Today L&D nurse blogger Nursing Birth wrote about her personal experience negotiating Pitocin protocols with her OB colleagues. It's a fascinating glimpse into the behind-the-scenes power struggles over patient care. I'd love to hear from other L&D nurses about Pitocin protocols where they work. Do the physicians you work with tend to be aggressive with their recommendations for Pitocin? Is it fairly common to negotiate, ignore, or disagree with the attending physician about your patient's Pitocin regimen? Please share your stories! 4. Place the client in a semi-Fowler's position. I'm so glad that everyone is talking about this. I'm really glad Jill (Keyboard Revolutionary) got the ball rolling. Thanks, Jill. Reality Rounds wrote a great post in response, too, about how hard it is to refuse a physician's order, complete with a guide on how to do so. There's not really enough context given in the scenario or those graphs, but those decelerations are called variable decels. They happen due to cord compression, and are generally a sign that a woman is fully dilated and ready to push, so the textbook answer is probably #2. Although if the woman is feeling an urge to push and doesn't want a vaginal exam, then you could try #1 and see what happens. Actually, it's early decelerations that usually indicate a woman is ready to push. They usually mirror the contraction in their length and depth. Variable decels are usually deeper and shorter-lasting than those... more like a quick "V" shape than a "U" shape. 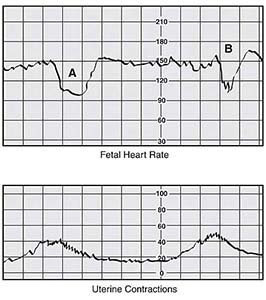 I thought the decels in that chart were late decels, given that they start in the middle of the contraction and recover afterwards. Late decels are due to suboptimal oxygenation/uteroplacental insufficiency (fitting since the discussion is about Pitocin/distress). I choose #3, turn off Pitocin. This topic is surely burning up the blogosphere. I loves it. I will not fathom to guess what to do with that strip since I am a NICU nurse. As far as refusing a physician order, I wish we could all just get along. Now it's time for me to ride my unicorn back over the rainbow forest. I just read those posts and am so appalled. I'm going to link to them on my blog too. ugh. I'm so glad I had a good hospital birth experience and hopefully I'll never have to have one there again. I also thought they were late decels--they begin after the peak of the contraction, rather than mirroring it. I'll have to check out Reality Rounds' post on it too. I too cannot guess which is the correct answer. When I had my hospital birth, I avoided looking at the strips and asked my family not to tell me "Boy, that was a big one!" Anyway, what I take offense to is the wording of one of the choices. By saying, "instruct women to push", well that is pretty much taking away her involvement in the experiance, right? Are we (as nursing students answering this question) to assume that all women will labor under the influence of an epidural or will need to be told to "hold it" or "push now" depending on the availablity of medical staff in the room? Is the the knowledge that our medical staff are coming into their careers with? Nope, they're variables due to their shape. Early and late decels are more subtle "u" shapes rather than "v" shapes. It doesn't matter where they are in relation to the contraction. These ones also have shoulders, the little bumps before and after the contraction, which are also a reassuring sign that the baby has plenty of reserve. And while early decels are a sign of descent, as they are due to head compression, it's really variable decels that you see when a woman is pushing. Typical NCLEX never gives you enough information. The variability in between is excellent and reassuring. As an L&D RN, I would want to know what her dilation was, reposition her, give her fluids, turn off the pitocin, notify the provider, and document all of the above. with a uterine contraction. Nadir of deceleration occurs at the same time as the peak of the contraction Generally, the onset, nadir, and recovery of the deceleration occur at the same time as the onset, peak and recovery of the contraction. ≥ 15 sec. and < 2 min. Thanks so much for the link! I too am so glad people are talking about this! Sometimes I feel when I write about some of the interactions I have with physicians that my readers think I am exhaggerating or that my hospital is somehow "special" in being particularly outrageous. That's a dangerous and naive way to think however!! Thanks again! Funny thing about the EFM commentary here. It *perfectly* illustrates how constant EFM is total crap--because nobody can agree on what they are seeing!! Super late to this party - but after I read about the caveats to EFM in a Swedish midwifery/CNM textbook I figured these kinds of data interpretation issues are what causally creates the link to a higher c-section rate. I am an engineer and we battle the "is this a blip or a catastrophe?" issue all the time. No data stands on its own, a human always has to interpret. I ended up transferring to a birth center to minimize risk (I was super healthy, no risk factors for birth complications, and was armed with the textbook plus knowing about pit to distress from blogs like this one.) The c-section rate in my county is close to 50%. Can't say for sure what's driving that but it seems likely my odds of being in a created emergency of some sort were high. Thank you for sharing these "inside stories". I would never, ever have thought other professions could have such relatively commonly encountered ethical lapses, especially when pregnant women and babies are involved. It gave me important actionable information to know that it does occur, even if I don't have rate information and would like to think the rate is low. Ok, if this is all of the strip you get to see -- it's not enough. Are these the first variables seen on the monitor? If so, I'm more of a wait and watch - I'd probably turn her on her side, which is not one of the answers provided. What was her last cervical exam? How long ago? Have these variables happened before? Are her membranes ruptured? Does she have an epidural? Lots of questions. They're definitely variables though. Depending on her particular situation - I might go with answer #2 of those provided. I'd want to know if there is a cord present, or if she is 10cm -- both distinct possibilities. I'm with the others that say that there really isn't enough information to select an answer. With these variables, *in my experience* 90% chance this person is complete or close to it and going to have her baby soon. So in *reality* (not necessarily NCLEX-world, which we all know is two different things), on my unit our first action would be to do an exam. Not unusually, but much less often in my experience, it looks this way at other times in labor (particularly after ROM) if baby's lying on the cord/has a tight nuchal cord, etc... sometimes it's resolved by position change, sometimes not. On my unit this would also be a watch and see (for a while anyway), probably trying multiple things depending on the situation. I could go on... cases are unique and have many facets... like I said, not really enough info to go on. This is because different providers practice in different ways. Sometimes things are obvious (for example, if these variables were to the 60's, probably anyone would go for a section unless delivery was imminent), but sometimes things are more subtle. Some providers are comfortable waiting and watching to "x" degree, others are more quick to act on things & intervene. The answer was #3: Turn of the Pitocin infusion.